Dark mission: Find the Chaos Emerald! Hero mission: Find the computer room! 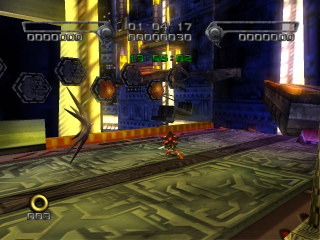 Cosmic Fall is one of five possible sixth levels of Shadow the Hedgehog; in the game's branching path structure, it follows from taking a somewhat heroic, GUN-aligned path through the previous levels. As the Black Arms attack the Space Colony ARK, its structural integrity is compromised and everything is beginning to go to pieces as Shadow the Hedgehog arrives on the scene. While outside platforms disintegrate and plummet towards Sonic's World, sirens wail throughout the interior corridors. Though everyone on board has merely fifteen minutes to vamoose before the area collapses, Doom's Eye and Vector still have business to attend to and would appreciate your assistance. One of the distinguishing characteristics of Cosmic Fall is its fifteen-minute time limit. While this is actually plenty of time to explore the level and complete missions, it's suggested that one doesn't dawdle too much. The name of the game of Cosmic Fall is its large expanses of bottomless pits. The player traverses them in a number of ways, including zip lines, simple platforming, chains of enemies to homing attack, light dashing, rails, springs and rolling through alien slime. If the way forward isn't immediately obvious, wait a sec; usually, a platform will soon arrive to your elevation. Other platforms are hazards unto themselves; some burst into flames and rapidly descend, while others rotate and make it difficult to get solid footing. Also beware of large enemies such as Black Oak, who lord over what little solid ground there is and are tricky to avoid. Falling to your doom while knocked back after taking damage is especially irritating. Bottomless pits are absent in the ARK's interior areas. So here, you'll have to deal with damaging green goo and periodic friggin' huge laser blasts. Also note the glass panels from which Shadow can Triangle Jump. After launching off these, they shatter, making your journey a one-way trip. It's difficult to recover from these should you screw up. Accessing the path leading to the hero mission's goal might require that you successfully navigate a chain of these glass panels. The alpha gang of enemies in this neighborhood are the Black Arms. Black Oak - Hog up space on teenie-weenie space platforms. Jumping over them when possible is recommended. The variety here tote Worm Shooters. Black Hawks - Exist entirely to provide stepping stones through space via the homing attack. G.U.N. forces are rather sparse around here, and seem to be making their last stand. LZ-1 Troopers - Tend to confront Black Oaks whenever possible, further reducing your toehold on precious solid ground. A few of the artificial Chaos beasties reside in the area following the power plant. If you bypass the Chaos Emerald accompanied with Doom's Eye, he might make a comment about how the water cyborgs are under the Black Arm's control. Either gun down Robotnik's blimp in Iron Jungle, flee to Prof. Gerald's lab in Lost Impact, or nab the Chaos Emerald in Space Gadget to arrive at Cosmic Fall. In the level's opening cutscene, Shadow Chaos Controls straight into a confrontation with the GUN Commander, who reveals the reason for his antipathy against the black hedgehog - he witnessed the Ultimate Lifeform's creation by Gerald and Doom 50 years ago. Shadow dodges a bullet from the Commander's own gun, but he promises to submit to justice if it turns out he really was responsible for the death of the ARK's population. Shortly after starting the level, Doom's Eye asks Shadow to retrieve a Chaos Emerald located in the ARK's power plant. As they enter the first interior area, Vector the Crocodile makes a surprise entrance,desperately searching for the ARK's computer room. What objective Shadow chooses ultimately depends on what actions the player takes in the final room of the power plant. Fall from the doorway to the floor and you'll be forced to complete the dark mission. If you so fancy, you can also Triangle Jump across breakable panels or Light Dash to an elevated platform on the other side, from which you can traverse one more section of crumbling debris before finding the computer room and completing Cosmic Fall's heroic mission. Settle for the dark mission and Dr. Eggman pops up with his Egg Dealer, determined to stop Shadow from tarnishing his granddaddy's legacy. After summarily trashing the Doctor's ridiculous machine, Shadow gathers all seven Chaos Emeralds, concludes that he is the ultimate lifeform created by Dr. Gerald Robotnik and takes up the helm as the Knuckles-style hermetic guardian of the ARK. The cantankerous Eggman is allowed to live, on the condition that he never again sets foot aboard the space station. Go the extra distance to complete the hero mission and Black Doom manifests himself, chastising Shadow for blatantly ignoring his previous orders. A scuffle between the two ensues, with Vector fighting on your side, for what it's worth. Shadow emerges victorious and gathers all seven Chaos Emeralds. A crippled Black Doom promises that his forces will rise again, but Shadow ignores him and makes a despondant monologue concerning himself as a disastrous military experiment that never should have been initiated. As Shadow mopes off, Vector makes a feeble attempt to cheer him up, raising the possibility that Shadow has misidentified his origins. In the hallway before the first room in the power plant area, and as such is extremely difficult to miss. Retrieve its five keys to reveal a switch inside, which generates some strings of rings. Light Dash upon them to more easily pass the laser room and access the path leading to the hero mission's objective.